The following error message will not close. “You haven’t backed up Roon yet! 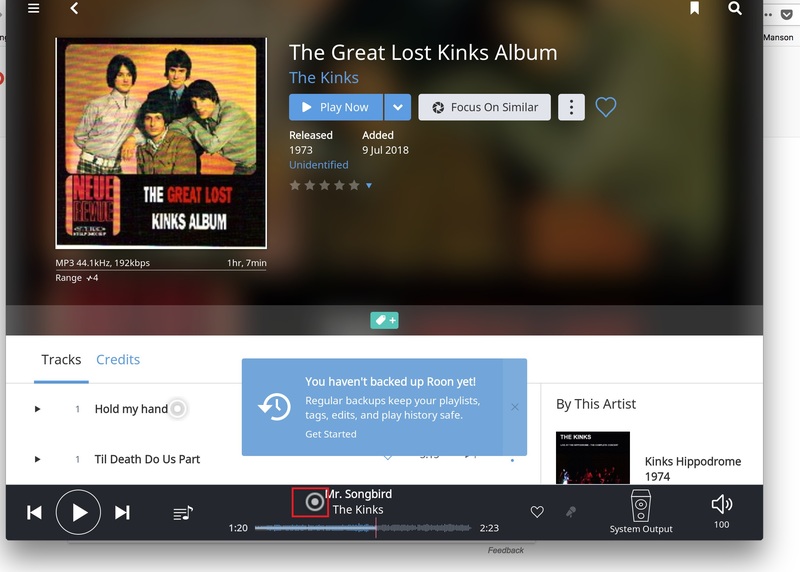 Regular backups keep your playlists, tags, edits and play history safe. However I have successfully backed up Roon according to the backup status. Please help as it’s annoying not being able to close the blue rectangle withe the error message on top. Thanks for contacting support, I’d be happy to take a look over this issue with you. 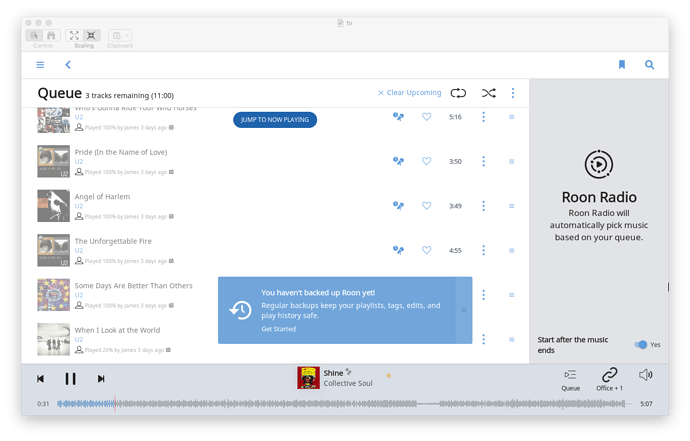 Can you please post a screenshot of what you’re seeing? There should be an option to close that message out , possibly an X in the top right-hand corner of the message if you hover your mouse over it if I remember correctly. Please let me know if this is not the case. there’s certainly an x to close the window, but when i close it it comes straight back. I’m speculating that the Roon Core has got itself into a funny state. Have you tried rebooting the Core? Thank you for the screenshot. As Carl mentioned, can you please try rebooting your Roon App and see if that triggers any change? You may also want to click all of the tutorial circles (as shown below) to see if that has any effect as well. The error message has disappeared, i’m not sure what I did. Not sure why the message disappeared, possible because of a restart of the Roon Core? In any case, I’m glad it did, and do let us know if the message reappears. I’m having the same problem as Paul. It prompted me to start running backups so I configured backups and ran them, but now the prompt is back and pops right back up when I click the X to close. There are no tutorial circles. When I click “get started” I can see that it has successfully backed up recently. Next time I need to reboot the roon core maybe it’ll go away, but I just wanted to register another data point for the un-dismissable backup prompt. 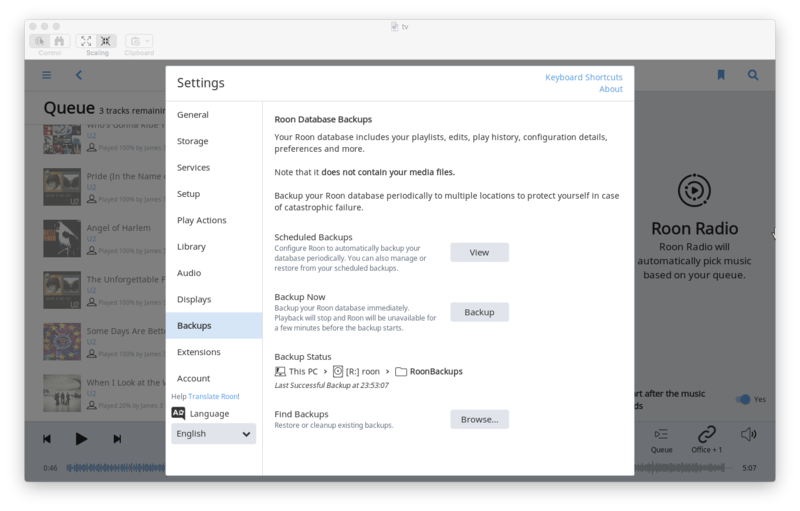 It looks like you backups are being saved to R: , can you let me know what type of drive this is? Was there any change after rebooting? It’s Windows 10, fully updated. It was fully updated before I installed Roon core. I’m not sure what other specs you need? The system is a fanless media PC with Atom CPU and 4GB RAM. R: is a samba shared drive from my linux server. This share is read-write. The music is retrieved from a similarly mapped network drive, but read-only, because I keep the music library itself protected. After rebooting the backup message did not reappear. Thanks for confirming that the Core reboot resolved this issue. I will add your report as another data point for the team. I am wondering if the Samba share had sometime to do with triggering this issue. @Paul_Elliott – it would be appreciated if you can confirm if your initial backup location was to a networked drive as well as that might be related. I am encountering the same issue with a new installation. Can you try rebooting the Core? Do you have any active tutorial circles by chance?